The Middle East Quarterly commissioned two essays presenting different views of the Qur'an and its passages dealing with the Holy Land and Jews. Here, Muhammad Al-Hussaini, a Muslim scholar, understands the text of the Qur'an to award the Holy Land to the Jews for all time, and he holds that Muslims can be convinced of this interpretation. In the second essay, Robert Spencer argues that Islamic law has not recognized and will never recognize Jewish rights to this territory. Many Muslims believe that Jerusalem is exalted in the Qur'an through reference to the "Night Journey" when the Prophet Muhammad is said to have traveled from Mecca to Jerusalem in a single night and ascended to heaven to come before God. "Glory be to Him, who carried His servant by night from the holy mosque to the further mosque." 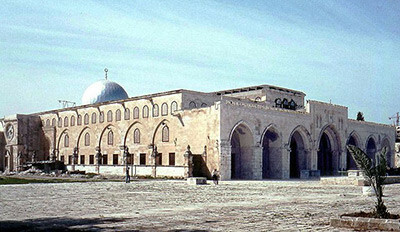 The "further mosque" is generally interpreted as the site of Al-Aqsa Mosque. Jewish claims to the Holy Land rest in passages of the Torah, in which the land is given to the Children of Israel in fulfillment of God's promise to them. In the book of Genesis, God promises the Holy Land to Abraham and his descendants unequivocally. Addressing Abraham, God says: "For all the land which you see, to you will I give it, and to your seed for ever" (Genesis 13:15). The promise is repeated to Abraham's son Isaac: "To you and your descendants I will give all these lands and will confirm the oath which I swore to your father Abraham" (Genesis 26:3). Muslims today derive meanings from the Qur'an that censure the Jews and exalt the city of Jerusalem through reference to the "Night Journey" when the Prophet Muhammad is said to have traveled from Mecca to Jerusalem in a single night and then ascended to heaven to come before God. Chapter 17 of the Qur'an ("The Night Journey") refers to this event: "Glory be to Him, who carried His servant [Muhammad] by night from the holy mosque to the further mosque [al-Masjid al-Aqsa]" (Qur'an 17:1). This "further mosque" is generally interpreted as Jerusalem or a place within it, often claimed to be the site of Al-Aqsa Mosque, built after Muhammad's death in 632. Until now, there has been no proper dialogue about these founding texts. But a dialogue is possible, first by recognizing that the Qur'an does, in fact, confirm the Biblical promise, then by re-reading commentaries on the Qur'anic text where the Jewish claim is strengthened. Beyond that, although the Jews come in for severe criticism in the works of Muslim apologists and theologians, there are no grounds in religious law to entertain the conceit that God's promise to the Children of Israel has been broken, and none to support the view that Israel is now the property of the Muslims. This effort involves an approach to the analysis of texts that requires Muslim scholars to take lessons from modern Biblical interpretation as practiced by Christian and Jewish exegetes working singly and together. If dialogue at this level were to become widely possible, the long-term implications for peace in the Middle East might be considerable. Islamic commentators simultaneously disdain and revere the Jewish roots of Islam; still some Muslim interpreters unambiguously understand the sacred territory as an Israelite inheritance through Islamic law. This kind of thinking is not uncommon. The Qur'an itself, divided between Meccan and Medinan verses, early and late, presents numerous contradictory statements that interpreters have found ways to reconcile. In both Judaism and Islam, the status and legal rights of a Gentile or stranger dwelling among Israel, or of the non-Muslim People of the Book, are all matters governed by sacred law. These rulings fall wholly within the purview of practical jurisprudence, not theologies concerning their salvation standing with God. Among rabbinic tractates, Avodah Zarah is replete with condemnation of the idolatrous worship of Christians and pagans, Tosefta Shabbat and Sanhedrin excoriate the falsity of the New Testament while at the same time, the rights and property of the stranger are protected and made sacred in Jewish law. They are unbelievers who say, "God is the Third of Three." No god is there but One God. If they refrain not from what they say, there shall afflict those of them that disbelieve a painful chastisement. To the Christians of Najran and the neighboring territories, the pledge of His Prophet are extended for their lives, their religion, and their property, to those present as well as those absent and others besides. There shall be no interference with the practice of their faith or their observance; nor any change in their rights or privileges. No one is to destroy a house of their religion, to damage it, or carry anything from it to the house of the Muslims. Should anyone take any of these, he would spoil God's covenant and disobey His Prophet. What is important to grasp is that to the Judeo-Islamic judicial mindset, there is absolutely no inconsistency, on the one hand, between implacable polemics against idolatrous Christians in matters of religious doctrine, and on the other, legal rulings that establish the fair rights, liberties, and rightful property ownerships of these nonbelievers according to sacred law. Both Jewish and Islamic sacred texts and their vast classical traditions of reading are quite big enough to hold both concepts—just as both traditions have in practice applied justice with the same changeability. Thus, more important even than the interpretation itself, this preparatory analysis is critical in helping form the correct reading of Qur'an 5:21, which commands, "O my people, enter the Holy Land which God has prescribed for you." It is necessary to stand this interpretation against the faulty equation that the anti-Jewish critique in the Qur'an cancels out all Jewish legal, religious, and property rights under Islamic law. Historically there have been two broad approaches to commentary on the Qur'an. One is to use received oral sayings of the Prophet and his Companions to interpret the text. The other is the application of reason as a tool for understanding Scripture. With the battles of the ninth century between the traditionalist Sunni party and the rationalist Mu'tazila school of thought, in which Sunnism emerged victorious, oral tradition became the primary instrument for the interpretation and explanation of Holy Writ. Ibn 'Abbas said, "Stones are about to rain down upon you from the sky! For I say to you, "The Prophet of God, may God bless him and grant him peace, said…" and you say, "But Abu Bakr [first caliph] and 'Umar [second caliph] said?" This unassailable reverence for an oral tradition written down for posterity has spectacular consequences in the case of the interpretation of Qur'an 5:21. Of particular interest is the medieval commentary on this verse by Abu Ja'far Muhammad bin Jarir at-Tabari (838-923), among the earliest and certainly the most revered fathers of the science of Qur'anic commentary and interpretation. After recounting the order from Moses to the Israelites to enter the Holy Land as commanded by God, Tabari explores the differing opinions received from a number of the Prophet's companions as to the identity of the territory in question, these being respectively "At-Tur [the Qur'anic term for Mount Sinai] and that which is around it," ash-Sham (the Levant), Ariha (Jericho) or Dimashq wa Filastin wa ma ba'da'l-Urdun (Damascus, Palestine, and Trans-Jordan). The Tabari commentary then proceeds to the critical phrase, allati kataba Allah lakum (Which God has prescribed [lit. "written"] for you) with the startling comment, "And the meaning of His saying, 'Which God has written for you' is that He 'confirmed' it in 'the Preserved Tablet' [i.e. the matrix of all scriptures, preserved in heaven] that it is yours as settlements and dwellings, in place of the oppressors who are in it." Among the key expressions alongside the juristic term kataba lakum (has written for you) is the expression "the Preserved Tablet," a reference to the Islamic conception of a divine blueprint in heaven from which all the revealed books—the Torah, the Psalms, the Gospel, and the Qur'an—have been sent down to man. Later on, Tabari elaborates upon the linguistic implications of kataba, citing other companions of Muhammad in their use of parallel terms for it, such as wahaba (granted, bestowed) and amara (ordered, commanded), concluding with a declaration from the mouth of the companion, Abu Qatada al-Ansari: "They were commanded it, in the manner they were commanded the prayer and the alms-due and the greater pilgrimage and the lesser pilgrimage," reflecting the understanding of Jewish commandments (mitzvot) in the mind of the early Muslims. The intended meaning is that they [the Israelites] were the best of their age, except that this community [i.e. that of the Muslims] is more noble than them, more favored before God, with the more perfect law, the more steadfast way of life, the more honored prophet, the greater kingdom, the more abundant bounties, the more plentiful wealth and children. For Ibn Kathir, Muslim superiority and supersession is naturally unquestionable and barely needs mention. But nowhere at any point does this classical commentator or any other dare to pretend an Islamic-Arab juristic claim upon the Holy Land, which the established and binding tradition of interpretation of the Qur'an has written for another. Other medieval commentaries on this verse and related verses in the Qur'an (17:1-8 and 101-104) deserve mention, notably the narratives relayed in the accounts by Abu'l-Qasim Mahmud az-Zamakhshari (1074-1143) and his detractor 'Abd Allah ibn 'Umar al-Baydawi (d. 1286 or 1292), who both discuss Abraham's ascension of Mount Lebanon, from which he surveyed the promised inheritance of his descendants. However, being so reverentially bound by inherited traditions, by and large, the consensus of commentators across the sectarian and historical span is strikingly consistent. The educated American reader will know that the bad habit that Muslims and Christians share in their reading of Scripture is the compulsion to move swiftly from text to dogma. This bad habit might manifest itself in the verse-slinging missionary on a doorstep or the pulpit preacher whose interpretation leaps up a very sharp incline from a single verse to unassailable dogma. However, a developing approach to a more nuanced engagement with text is a deliberately juxtaposed reading of Islamic Scriptures and traditions in parallel with Jewish and Christian sacred books by scholars from all three faiths—a process known as "Scriptural Reasoning." This began as an intra-Jewish activity at Princeton, exploring how sacred texts might be an instrument for tikkun olam, or repair of the world. In Britain, however, this approach has been taken out of the ivory towers and onto the streets of Muslim communities, resulting in the historic achievement of the first fatwa (religious edict) in modern times issued in 2007 by senior Islamic authorities, giving sanction for lay Muslims to meet with Jews and Christians for interfaith dialogue and frank debate around their sacred texts. Thus a powerful instrument has emerged for the novel exploration of hitherto closed interpretative questions of Muslim relationships with other peoples and faiths—including those of the Middle East conflict. From a Jewish perspective, there are more important humane considerations for the sanctity of human life, of justice and rights for the Palestinian people that respect human dignity, self-determination, and parity of esteem—things safeguarded by the best of Judaism's legacy of rabbinic wisdom. At the same time, Muslims need to recognize the extent to which a vacuum has been created by the absence of any explicit Qur'anic counterclaim to the Holy Land. This missing concept has been filled instead with Judeophobia—the popular demonization of the Jewish people, embraced as a substitute for the lack of a heavenly eviction order. The mass importation and translation of Western anti-Semitic materials into the Muslim milieu represents possibly the most disturbing novel development, rendering Jewish-Muslim engagement all the more critical. It should in all respects be vividly apparent that it is in the interpretative relationship between Muslim peoples and Islam's sacred scripture—at this powerful and explosive nexus—that a significant part of our shared history will be written in the coming century. And it is here, therefore, that our conversations as Abrahamic believers round the family table and our reasoning together around scripture must begin. Muhammad Al-Hussaini is fellow and lecturer in Islamic Studies at Leo Baeck Rabbinical College, London. All translations of the Qur'an from A. J. Arberry, ed., The Koran (London: Allen and Unwin, 1955, subsequently Oxford University Press). Muhammad Hamidullah, Majmu' al-Watha'iq as-Siyasiya (Cairo: Lajna at-Ta'lif wa 't-Tarjama wa 'n-Nashr, 1956), pp. 111-2. A. Zahoor and Z. Haq, trans., "Prophet Muhammad's Charter of Privileges to Christians: Letter to the Monks of St. Catherine Monastery," accessed July 26, 2009. Ibn al-Athir, An-Nihaya fi Gharib al-Hadith, Mahmud Muhammad at-Tanahi, ed. (Cairo: Dar al-Ma'arif, 1385/1965-66), 4:71. 'Abd al-Jabbar, Tanzih al-Qur'an 'an al-Mata'in (Beirut: Dar al-Kitab al-'Arabi, n.d.), pp. 118-9. Abu 'l-Fath Muhammad ash-Shahrastani, Kitab al-Milal wa 'n-Nihal, 3 vols. (Cairo: Dar al-Ma'arif, 1948), 2:12-3. Leah Kinberg, "Muhkamat and Mutashabihat (Koran 3/7): Implication of a Koranic Pair of Terms in Medieval Exegesis," Arabica, 35 (1988): 143-72. Muhammad bin 'Abd al-Wahhab, Kitab at-Tawhid alladhi huwa Haqq Allah 'ala 'l-'Abid, (Mecca: Muslim World League, 1400/1980), p. 63, (author's translation). Abu Ja'far Muhammad b. Jarir at-Tabari, Jami 'al-Bayan fi Tafsir al-Qur'an, 12 vols. (Beirut: Dar al-Kutub al-'Ilmiyya, 1412/1991-92), 15:127. Tabari, Jami', on Qur'an 2:62. Isma'il bin 'Umar Ibn Kathir, Tafsir al-Qur'an al-Karim, Yusuf 'Abd ar-Rahman al-Mar'ashli, ed. (Beirut: Dar al-Ma'arifa, 1987), on Qur'an 5:24, (author's translation). Tabari, Jami', on Qur'an 5:21, (author's translation). Abu Nasr Isma'il b. Hammad al-Jawhari, Taj al-Lugha wa sahah al-'Arabiyya, Nasr al-Hurini, ed. (Cairo: Dar al-Ma'arif, 1365/1946), 2:287. Ibn Kathir, Tafsir, on Qur'an 5:20. Abu'l-Qasim az-Zamakhshari, Al-Kashshaf 'an Haqa'iq Ghawami' at-Tanzil wa-'Uyun al-'Aqawil fi Wujuh at-Ta'wil, 4 vols. (Beirut: Dar al-Kitab al-'Arabi, n.d.), on Qur'an 5:21. Steven Kepnes, "A Handbook for Scriptural Reasoning," Modern Theology, June 2006, pp. 367-83. Peter Ochs, "Introduction," in Textual Reasonings: Jewish Philosophy and Text Study at the End of the Twentieth Century, Peter Ochs and Nancy Levene, eds. (Grand Rapids: Eerdmans Publishing Company, 2002), pp. 2-14; idem, "The Logic of Indignity and the Logic of Redemption," in God and Human Dignity, R. Kendall Soulen and Linda Woodhead, eds. (Grand Rapids: Eerdmans Publishing Company, 2006), pp. 143-60. Muhammad Fathallah, Salah al-Ansari and Muhammad al-Salamoni, "Fatwa on Scriptural Reasoning," Scripturalreasoning.co.uk, accessed May 1, 2009. Jenny Williams, "Sense and Spirituality," The Baptist Times (Didcot, U.K.), Mar. 12, 2009; Chad Pecknold, "Preface: The Promise of Scriptural Reasoning," Modern Theology, June 2006, pp. 339-43. See, for example, Sayyid Qutb, In the Shade of the Quran (Leicester: Islamic Foundation, 2007), on Qur'an 5. Related Topics: Islam, Israel & Zionism, Jews and Judaism | Fall 2009 MEQ receive the latest by email: subscribe to the free mef mailing list This text may be reposted or forwarded so long as it is presented as an integral whole with complete and accurate information provided about its author, date, place of publication, and original URL.